An 8.5 x 11 printed sheet using quality inks is included in this collection along with a Premium Download you can print yourself. Baroque Miniature Nativity 1, depicting the Adoration of the Magi, is set in an ornate proscenium. 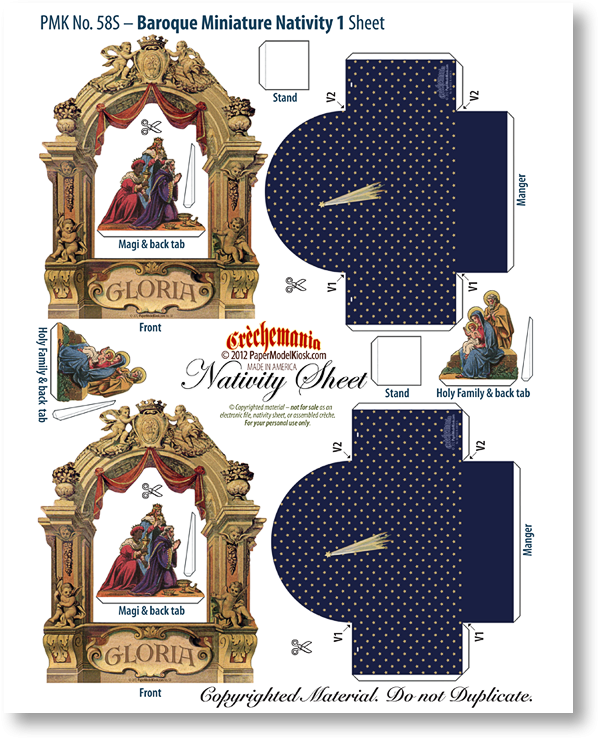 You'll love creating the delightful Baroque Miniature Nativity with this quality-printed 8.5 x 11 heavyweight sheet. And you'll also love having the Premium Download PDF to print it again and again to your heart's desire. An ornate proscenium encloses the Nativity which is depicted in amanger blazing with the Star of Bethlehem set amidst a myriad tiny stars. The proscenium setting —festooned in red-and-gold trim and decorated with urns, scrolls, and angels — framesthe Adoration of the Magi. 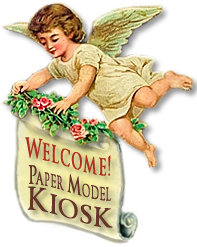 And, evoking the song of the angels, "Gloria," is written in an elaborate script enclosed by a scroll. Size: 3.5 x 4.38 x 0.75 inches.